Dia 14 - Colóquio informal em que estudantes de todos os graus poderão apresentar as suas questões ao autor. Prevista a utilização de elementos em power point para aqueles que o desejarem. Esta sessão conclui às 18,30 horas. Não perca uma das mais importantes figuras da arqueologia mundial, no Porto! A entrada é livre !!!!!!!!! Julian Thomas was born in Epsom in 1959, and educated at the Universities of Bradford (BTech in Archaeological Sciences, 1981) and Sheffield (MA 1982, PhD 1986). His doctoral research was concerned with social and economic change in the Neolithic of Wessex and the Upper Thames valley. He was a lecturer in archaeology at the University of Wales , Lampeter between 1987 and 1993, and taught at Southampton University from 1994 to 2000. He took up the Chair of Archaeology at Manchester in April 2000. Julian's main research interests are concerned with the Neolithic period in Britain and north-west Europe, and with the theory and philosophy of archaeology. His major preoccupation throughout his career has been with finding ways of understanding prehistoric societies which confront the prejudices and assumptions of the contemporary west. Themes within this broader set of concerns include landscape and monumentality; the archaeology of death; the social role of material culture; the body, personhood and identity; the relationship between archaeology and anthropology; the history of archaeological thought; the contemporary political significance of archaeology; and the use of hermeneutic, phenomenological, feminist and post-structuralist philosophies in archaeology. He has recently published a study of the relationship between archaeology and modernity, which explores the connections between archaeological knowledge and the modern condition. 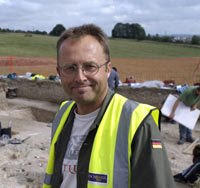 Throughout his career, Julian has been involved in field archaeology. Between 1994 and 2002 he was director of a collaborative project with Historic Scotland, concerned with the investigation of a series of prehistoric monuments in Dumfries and Galloway. The first three of these sites, the henge at the Pict's Knowe, the cursus complex at Holywood, and the post alignments at Holm, form the basis for a monograph which is nearing completion. The second phase of the project (from summer 1999 onwards) involved the sample excavation of a late Neolithic enclosure complex at Dunragit, near Stranraer. More recently, he has become one of the directors of the Stonehenge Riverside Project, together with Mike Parker Pearson (Sheffield), Joshua Pollard (Bristol), Colin Richards (Manchester), Chris Tilley (UCL) and Kate Welham (Bournemouth). Within this project, he has undertaken a re-excavation of the southern timber circle within the great henge of Durrington Walls, and in 2006 investigated two hengiform enclosures inside the Durrington monument. These proved to contain small buildings surrounded by timber palisades. Julian is Vice Chair of the Standing Committee for Archaeology, which represents university archaeology within the UK. He was a Vice President of the Royal Anthropological Institute between 2001 and 2004, and remains a member of the RAI Council. He was the Secretary of the World Archaeological Congress between 1994 and 1999. He is a life member of the Collingwood Society, and is Associate Director of the AHRB Research Centre for Textile Conservation and Textile Studies. He is editor of the Routledge series, 'Themes in Archaeology', which has recently published volumes by Chris Fowler, Gavin Lucas and Tim Insoll. Julian welcomes enquiries from prospective research students interested in British and European prehistory, or any aspect of archaeological theory. In his spare time Julian enjoys the countryside, reading, music, swimming, and the company of his small children. 1996 Time, Culture and Identity: An Interpretive Archaeology. London : Routledge. 1996 (ed. with T.C. Darvill) Neolithic Houses in Northwest Europe and Beyond. Oxford : Oxbow Monographs. 1999 Understanding the Neolithic. London : Routledge. 2000 (ed.) Interpretive Archaeology: A Reader. Leicester : Leicester University Press. 2001 (ed. with T.C. Darvill) Neolithic Enclosures of North-West Europe. Oxford : Oxbow Monographs. 2001 (ed. with R. Layton and P. Stone) The Destruction and Conservation of Cultural Property. London : Routledge. 2004 Archaeology and Modernity. London : Routledge. 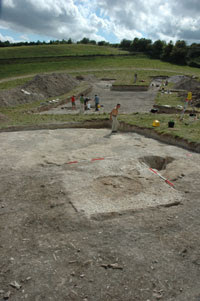 2006 Place and Memory: Excavations at the Pict's Knowe, Holywood and Holm. Oxford : Oxbow Monographs. 2000 Death, identity and the body in Neolithic Britain (the Curl Lecture for 1999). Journal of the Royal Anthropological Institute 6 , 603-17. 2002 Gelebte landschaften: gedanken zu einer archÃ¤ologie von landscaft und ort. Hagia Chora 12/13, 44-9. 2003 Thoughts on the 'repacked' Neolithic revolution. Antiquity 77, 67-74. 2004 Archaeology's place in modernity. Modernism/Modernity 11, 17-34. 2004 Recent debates on the Mesolithic-Neolithic transition in Britain and Ireland. Documenta Praehistorica 31, 113-30. 2004 Ambigious symbols: why there were no figurines in Neolithic Britain. Documenta Praehistorica 32, 167-75. 2006 From dwelling to building. Journal of Iberian Archaeology 8, 349-59. 2000 Reconfiguring the social, reconfiguring the material. In: M.B. Schiffer (ed.) Social Theory in Archaeology, 143-55 . Salt Lake City : University of Utah Press. 2000 The identity of place in Neolithic Britain: examples from south-west Scotland . In: A. Ritchie (ed.) Neolithic Orkney in its European Context, 79-87. Cambridge : McDonald Institute. 2001 Archaeologies of place and landscape. In: I. Hodder (ed.) Archaeological Theory Today, 165-86. Cambridge : Polity Press. 2001 Intersecting landscapes. In: B. Bender and M. Winer (eds.) Contested Landscapes, 165-72< London : Berg. 2001 (with R. Layton) Introduction: the destruction and conservation of cultural property. In: R. Layton, P. Stone and J.S. Thomas (eds.) The Destruction and Conservation of Cultural Property, 1-21. London : Routledge. 2002 Archaeology's humanism and the materiality of the body. In: Y. Hamilakis, M. Pluciennik and S. Tarlow (eds.) Thinking Through the Body, 29-45. London : Routledge. 2002 Taking power seriously. In: M. O'Donovan (ed.) The Dynamics of Power, 35-50. Carbondale : Southern Illinois University Press. 2003 (with K. Ray) In the Kinship of Cows: the Social Centrality of Cattle in the Earlier Neolithic of Southern Britain . In: M. Parker Pearson (ed.) Food and Culture in the Neolithic. Oxford : British Archaeological Reports. 2004 The great dark book: archaeology, experience and interpretation. In: J.L. Bintliff (ed.) A Companion to Archaeology, 21-36. Oxford : Blackwell. 2004 The ritual universe. In: I. Shepherd and G. Barclay (eds.) Scotland in Ancient Europe, 171-8. Edinburgh: Society of Antiquaries of Scotland. 2004 Materiality and traditions of practice in Neolithic south-west Scotland. In: V. Cummings and C. Fowler (eds.) The Neolithic of the Irish Sea : Materiality and Traditions of Practice. Oxford : Oxbow. 2005 Ceremonies of the horsemen? From megalithic tombs to Beaker burials in prehistoric Europe. In: M.A. Rojo-Guerra, R. Garrido-Pena and I. Garcia-MartÃ nez de LagrÃ¡n (eds.) Bell Beakers in the Iberian Penisula and their European Context, 107-35. Valladolid: University of Valladolid. (includes Spanish translation). 2006 Phenomenology and material culture. In: C. Tilley, W. Keane, S. KÃ¼chler, M. Rowlands and P. Spyer (eds.) Handbook of Material Culture, 43-59. London: Sage."